Hassan Rouhani has officially replaced Mahmoud Ahmadinejad as president of Iran. 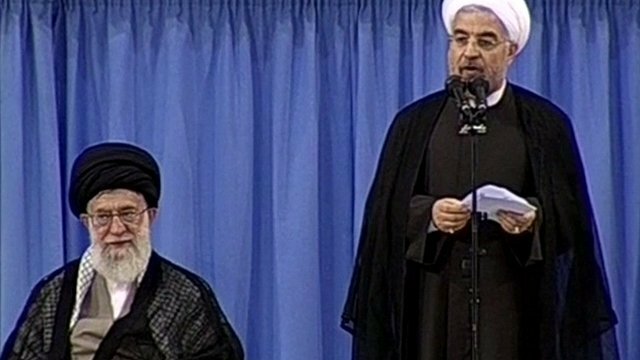 Cleric Hassan Rouhani’s election has been endorsed by Supreme Leader Ayatollah Ali Khamenei at a ceremony in the capital, Tehran. He won the presidential poll in June, promising to reform and to put an end to Iran’s international isolation. He is a former nuclear negotiator for Iran and was an Islamic activist before the 1979 Revolution. Hassan Rouhani, 64, has the support of Iran’s reform movement, which wants the new president to release political prisoners and have international sanctions lifted. But while he may be taking over as president, Hassan Rouhani will not be Iran’s main decision-maker. In the Islamic Republic, it is the Supreme Leader, not the president, who has the final say. The day before he took office, Hassan Rouhani said Israeli occupation was an “old wound on the body of the Islamic world”, as Iran marked its annual Jerusalem (Quds) Day. Iran has denied Israel’s right to exist since the 1979 Islamic revolution. In his last interview before stepping aside on Friday, Mahmoud Ahmadinejad also attacked Israel, warning of “storm brewing” in the region that would uproot Zionism, according to AFP news agency. Many Iranians believe Mahmoud Ahmadinejad, elected twice in controversial polls, has put Iran on the path to economic ruin and confrontation with the outside world.